The GIS-based model SliDepot simulates the runout zones of landslide prone areas. It was developed by GEOTEST AG and applied during the last 10 `years for numerous projects. In combination with the SliDisp+ software (modelling of slope instabilities, cf. Tobler and Krummenacher (Modellierung von Anrissgebieten für flachgründige Rutschungen und Hangmuren. In: Proceedings of the 2nd Swiss geoscience meeting, Lausanne, 2004); Tobler et al. 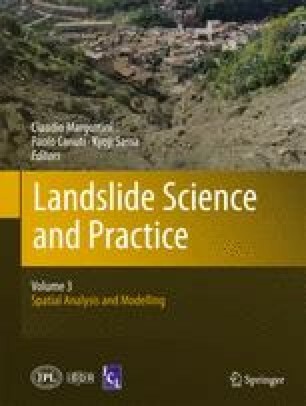 (Modeling potential shallow landslides over large areas with SliDisp+. In: Proceedings of the second World landslide forum, Rome, 2011) SliDepot allows to calculate decisive parameters for the dimensioning and optimized positioning of protection measures. In contrast to other GIS-based models “Casadei et al. (Earth Surf Process Landf 28:925–950, 2003); Godt et al. (Eng Geol 102(3–4):214–226, 2008)”, SliDepot does not rely on a single-flow approach, which calculates the flow direction by direct neighbourhood relationship. The software is capable of analysing multiple cells in a 20°-sector above a potential runout area up to the extent of four cells. The potential runout cell will only be connected to the runout area if the mentioned 20°-sector contains an instable cell or if the necessary initial volumes of mobilised mass are guaranteed. Furthermore the program also considers geomorphologic phenomena like convex topography. With this approach the runout direction is simulated fairly realistic. The runout is based on the degradational water content of the sliding mass during its downslope movement which finally leads to the break-off. Results from a case study in Switzerland will be presented. We would like to thank GEOTEST AG for supporting the development of the model. Thanks also to all persons involved in the technical discussions.